Known for its white sand beaches, Pandanon Island is a popular spot on island-hopping itineraries from Cebu or Bohol. If you’re coming from Mactan in Cebu, after an 80-minute pumpboat ride you’ll arrive on pristine coral sand to enjoy the simple things in life: snorkeling among tropical fish, sunbathing on the beach, renting out a thatched-roof hut on the beach with friends and family. Slightly further away from Cebu than islands like Hilutungan, Nalusuan, and Caohagan, Pandanon is known for being a peaceful place. There are no resorts or hotels, and if food and drinks aren’t provided on your island-hopping boat tour, it’s a good idea to bring your own refreshments even though there are a few small stores on the island. Looking out to the island of Bohol, at low tide Pandanon Island’s famous sandbar winds 1km out to sea, giving you a chance to go for a stroll by the Sulu Sea. And if you want to get married on the beach, there’s also a little chapel by the water. 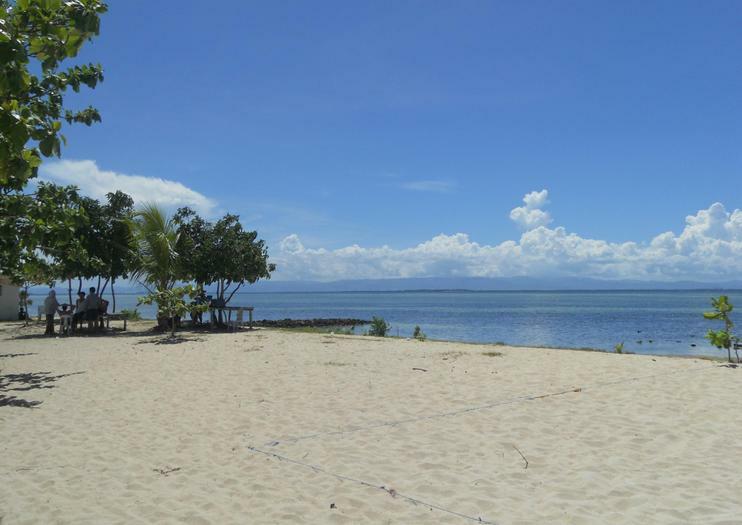 Entrance to the private island is P150, and you can rent a beach hut for the whole day for P250. Travel time for Cebu is 80 minutes, and from Getafe in Bohol it’s a half-hour trip. There are plenty of bathrooms, and beach huts have their own barbecues where you can cook. Explore the islands and waterways around Mactan Island on this 6-hour island-hopping and snorkelling adventure from Mactan Island or Cebu. Hop aboard your motorized canoe and head out onto the waves with your guide. Cruise through the beautiful Hilutungan Island Marine Sanctuary, and admire panoramic views over the islands and beaches dotting the Philippine Sea. Visit Nalusuan Island or Pandanon Island, and watch colorful tropical fish darting through the clear waters. Savor a delicious grilled seafood lunch on the beach and enjoy free time to relax at your leisure. Discover the incredibly wonderful world underwaters in Panglao, by joining this Bohol Scuba Diving Experience! You will be taken into a whole different world in which you can admire the colorful fish, the various shapes of corals, and the amazing many kinds of sea creatures. To experience this activity, for you who are still new to this water activity will get to learn some basic dive skills from the friendly and experienced instructors. They will make sure that you will be able to dive safely there. This ctivity will make some of the most memorable vacations in you life! This adventure begins with a stop at the beautiful Nalusuan Marine sanctuary.Enjoy swimming, snorkeling.We then proceed on our adventure with a stop at the pristine beach on Pandanon Island. Take your morning island tour with our snorkeling adventure to Nalusuan island! Snorkel into the wonders of underwater garden of this island marine sanctuary and be dazzle by the vibrant colors reflected by the rising sun as you start your day snorkeling in the middle of the marine life during this tour.Pandanon Island lies between Cebu province and Bohol Province about 1-2 hours by local outrigger boat from Mactan Island (it's faster with our boats). If the weather is right, though, you can see Bohol Island.While the west side of Pandanon Island has a 2,000-person village, the east side feels like a private island. It is undeveloped and more secluded than Hilutungan Island, Nalusuan Island, and Cauhagan Island.This tropical island has white sand beaches and white sandbars. The crystal clear blue water has high visibility. And the shallow water is great for swimming. For shade, Pandanon Island has cottages for rent. There is also a quaint, small hut in the middle of the water. Pandanon Island lies between Cebu province and Bohol Province about 1-2 hours by local outrigger boat from Mactan Island (it's faster with our boats). If the weather is right, though, you can see Bohol Island.While the west side of Pandanon Island has a 2,000-person village, the east side feels like a private island. It is undeveloped and more secluded than Hilutungan Island, Nalusuan Island, and Cauhagan Island.This tropical island has white sand beaches and white sandbars. The crystal clear blue water has high visibility. And the shallow water is great for swimming. For shade, Pandanon Island has cottages for rent. There is also a quaint, small hut in the middle of the water.